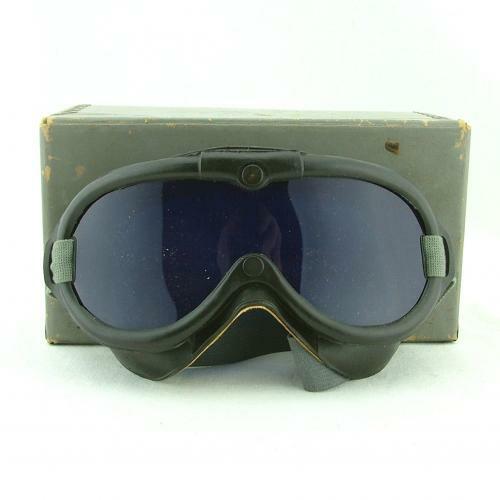 Goggle for Simulated Blind Flying, 1-F-4b. By the American Optical Company. The one-piece rubber frame is virtually identical to that of the wartime type B-8, completely flexible and backed with beautifully clean chamois. The frame has USN markings, device reference details and a 1953 date. Excellent strap retaining good elasticity. Fitted with a deep blue tinted lens. With card carton of issue. These would appear to be unissued and have minor storage wear only. Stock code G21107.